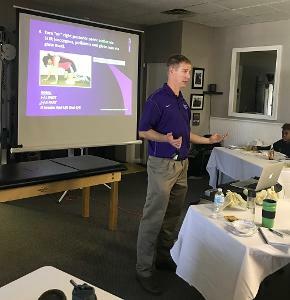 Returned from Florida this week after a great first PRI course in Bradenton where we hosted some great clinicians from the greater Tampa Bay area and beyond. Many thanks to John Walz, and the team at Request Physical Therapy who provided an inviting, high positive energy environment in which to learn the science of Pelvis Restoration. Our local hub and this weekend’s lab assistant was my friend Megan Bollinger from the PRC class of 2012, whose passion for this science is both admirable and contagious. Can't say enough about how much I appreciate Megan's unassuming, caring demeanor during courses and as a fantastic host. This interdisciplinary group of movement pros, from Hiroki Yoshimoto, ATC to Heidi Goldman, LMT, Sharon Yadven OTR/L to the “Traveling Timlers,” PT’s Megan and Paul was particularly interested in clinical application of PRI pubo-sacral dynamics of the ‘how and when’ to utilize the principles of this course material. We explored anatomy, neurologic application, arthrokinematics and osteokinematics of positioning human systems in ways to optimize pelvis content and surroundings including how to integrate said systems into dynamic living machines with synchronized pelvic and thoracic diaphragms. Our multiple lab times focused on discussing and feeling tests and treatment techniques aimed at achieving tri-planar control of a pelvic as well as its mirror ipsilateral thoracic diaphragm and designing a program to do so. This instructor enjoyed the lively class participation from front row Jessika McNeil and Brianna Nelson all the way to back row light crew Nick Dwyer. We were especially thankful to have both Megan Bollinger, PT, PRC and Karen Hoyt, PT PRC who both practiced and assisted during lab time, allowing us to cover lab with depth sometimes not allowed. During lab times, thank you Sharon Yadven, John Walz, Megan Timler, Paul Timler, Nick Dwyer, Hilary Arichego and many others for your contribution to the class as we learned together for demonstration time of techniques. And, thank you all for a great learning environment and experience in Western Florida. What a blast!